This year is the 100th Anniversary of the founding of Citizen, to commemorate this event at Baselworld 2018 Citizen announced the aptly named Calibre 0100. This is their most accurate Eco-Drive movement with an annual accuracy of ±1 second. Citizen has been developing highly accurate quartz movements since the early 70’s. In 1973 they introduced the calibre 8810A that was rated at ±5 seconds per month. This movement was used in the Citizen EFA (Extra Fine Accuracy). This was a significant improvement over the standard ±15 seconds per month that most quartz movements at the time were rated at. Continuing to improve upon the accuracy of their watches Citizen developed the calibre 8650A and in 1975 this was launched inside the Crystron 4 Mega (ECQ-W86A). This was a massive step up in accuracy and the watch had a rated accuracy of ±3 seconds per year. This accuracy came at cost with the first 4 Mega model priced at ¥4,500,000. The watch was housed in an 18K yellow gold case, bracelet and crown, with an octagonal sapphire crystal. Obviously some of the cost can be attributed to the watch construction but a significant portion of the pricing would have been due to the movement. As a pricing comparison the second most expensive Citizen watch at the time was the ECQ-W88A EFA model, with a 8810A movement, that was priced at ¥135,000. In addition to accurate quartz movements Citizen has become synonymous with light powered movements. Citizen developed the world’s first analog solar model in 1976, the SCQ-8629. This model was priced at ¥45,000. Citizen continued to develop solar powered watches and by the 1990’s there were many solar models in the line up. In late 1995 Citizen introduced the Eco-Drive branding and at this time the Eco-Drive brand was used on a wide range of different models. There were new models as well as many existing solar models that were rebranded and grouped under the unified Eco-Drive branding. This initial range of models can be seen in the 1996 Volume 1 Citizen catalog. The Eco-Drive branding has been extremely successful for Citizen and they are widely seen as the leading company for solar / light powered watches. The new calibre 0100 is the pinnacle of Citizen’s Eco-Drive and quartz development. This movement is rated at ±1 second per year. To achieve this level of precision Citizen developed a number of key technologies for the movement. The first unique feature of the movement is a specially selected quartz crystal oscillator. Instead of using a traditional tuning fork style (X-cut) of crystal the 0100 uses a AT-cut crystal oscillator. The AT-cut was first discovered in 1934 by Messrs. F.R. Lack and G. W. Willard while working at Bell Labs. The different types of crystal cuts are defined by the angle that they are cut from within the quartz crystal structure. The AT-cut is produced by a cut at an angle of 35° 15’ from the Z-axis of the crystal. The AT-cut has a number of features that make it desirable for high precision timekeeping. The first is the ability to be influenced by positional orientation. With a tuning fork crystal as it is rotated and moved in space, such as swinging on a users wrist, the gravitational forces and inertia will slightly alter the oscillation of the crystal. An AT-cut crystal is not impacted by positional variation and gravitational forces in the same way so it is much more stable under a wide range of conditions. Another factor that will influence the consistency of a crystals oscillation is temperature. A quartz crystal will be stable at 25°C but as the temperature moves higher or lower than this point the stability will change. An AT-cut crystal is significantly less impacted by temperature changes and produces a more stable frequency across the typical temperature range. While the AT-cut is more stable across different temperatures there are still some variation. In order to compensate for this error the movement is fitted with a temperature correction function. Each minute the temperature is monitored and variations compensated for. To ensure the compensations are accurate each movement is evaluated and a record of the performance at different temperatures is recorded. For the calibre 0100 the number of points is doubled from previous Citizen high accuracy quartz movements. The other obvious differentiation between a traditional tuning fork crystal and the AT-cut crystal is the frequency that it resonates at. A traditional crystal used in quartz watches will operate at 32 kHz. The AT-cut crystal in this model Citizen operates at 8.4 MHz (8,388 kHz), 256 times higher than the normal watch oscillator. The higher oscillation frequency results in a higher power requirement for the crystal and this is why AT-cut crystals have not been traditionally used in a watch despite their better positional and temperature performance. Luckily Citizen has been able to mitigate the higher power requirement by incredibly efficient power design in other parts of the watch that results in the calibre 0100 still being able to operate for six months from a full charge. To ensure that the watch hands are always correctly positioned the movement is fitted with an anti-shock function that instantly locks the rotor when a shock is detected. After the shock the hand is then repositioned to match the correct position. To display this new movement Citizen presented the calibre at Baselworld in a pocket watch configuration. The watch has a sapphire crystal case that surrounds a simple white dial. The dial has markers at 12, 3, 6 and 9 o’clock that are shaped like a quartz crystal and the end of the seconds hand also has a crystal shaped design. 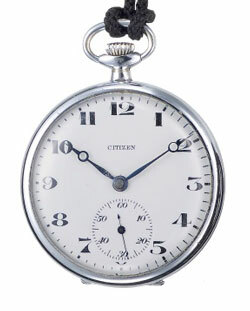 According to Citizen this design is intended to pay homage to the first Citizen pocket watch that was released in 1924. While they are both pocket watches the design seems to bear no other resemblance with different styled hands, dial, case, crown and bow components. If they really wanted to pay homage to the initial model then matching the indicie markings and hands would have been more appropriate. That being said I do like the design of the Baselworld prototype. It should be noted that this model is really just a proof of concept and Citizen has already stated that the calibre 0100 will not be publicly sold but instead the technologies found inside the movement will be introduced in future models launched in 2019. While this watch will not go on sale it is very impressive technology to be able to produce a movement able to be independently accurate to ±1 second per year. As a point of comparison most Seiko 9F quartz models are rated at ±10 seconds per year while some specialised 9F models are rated at ±5 seconds per year. Other watches that sync to an external source, like a radio signal or GPS, are considerably less accurate if isolated. For example a Seiko GPS sync Astron is rated at ±15 second per month unless it is synced to a GPS clock. I look forward to seeing what Citizen brings to market next year utilizing these technologies.